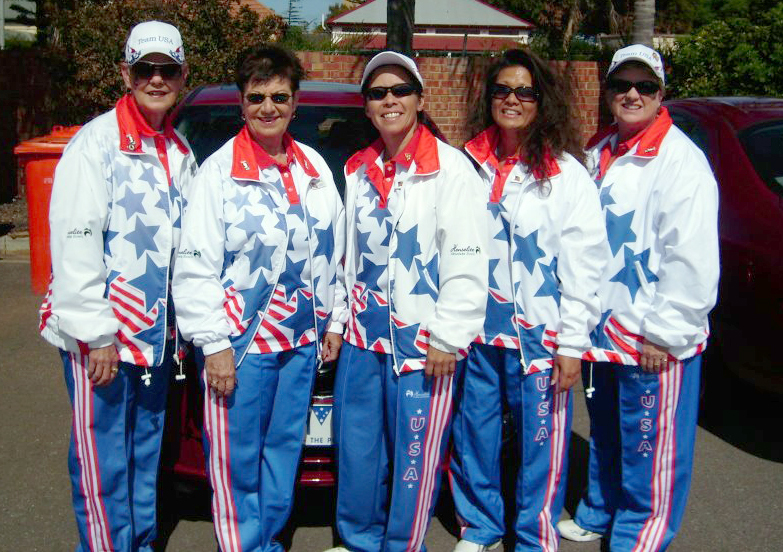 Michele is playing lead on the Women's triples team with Dee McSparren and Kottia Spangler(skip) from the SW division and lead on the Rinks team with Carrie Fossati, Anne Nunes and Kottia Spangler. Below are quick snippets from Michele on the front lines. Day 6 : "We all had 1 game today, women's singles won. Mens triples tied and mens pairs and women's rinks lost. Two more days of regulation play. " Day: 5: "Rinks, Dee McSparren is playing singles. We went 1-1, came close with the Australia game 12-13 in the 13th end, but lost a 4 and never recovered. Mens pairs are 1-1 with a nice win over New Zealand. Mens triples had a bye so are 1-0 beating Japan. Womens singles 0-2. Women's teams have a bye tomorrow morning then the rinks plays Philippines and singles plays Japan. Greens at every club, even the local ones not hosting the tournament, are faster than anything that we have in the US. Well maybe the artificial surface at Santa Cruz might compete. The Asia Pacific Games specifically hired a special greenskeeper just for this tournament. Both clubs have their own greenskeeper but they wanted someone specific to get the greens right." Day Four: "Mens rinks made it into the quarterfinals, they play New Zealand Dec 8. If they win they are guaranteed a bronze medal and a chance to play Australia or Malaysia for gold or silver. The other disciplines didn't do as well. The women's triples won our last game and finished fourth. Tomorrow women split into rinks and singles and the men start to play pairs and triples. The forecast for the next few days is for more sun and wind." Day Three: "Down 2 today. Beating Australia on their turf is tough. Lost to Norfolk Island in the afternoon. Women's pairs beat Fiji in the afternoon, morning was a bye. Mens singles down 2, mens rinks 1-1. Still blazing fast conditions, sun has been out, no rain and the wind is blowing...."
"Didn't do as well today, lost by 2 to Brunei, big day tomorrow vs undefeated Australia." Michele also sent a different link than we had previously posted to follow complete results! Thanks Michele! Day One: Michele reported that she experienced "16 second greens AND 20 mph winds! Women triples won our first game vs Samoa, men rinks won vs China, women pairs lost to Brunei, men singles had a bye. Hopefully tomorrow won't be as windy. Go Team USA!" (not at the Asia-Pacific Games) by Tee Adams. From our singles rep. Steve Nelson posting on facebook. Lost to world #2, Brett Wilke 17-21. Awesome game. Played well, hung in there, but he ain't #2 for nothing. Have never felt so good after a loss. Our men's fours team is thru to qtr finals so that's the good news from down under. Now on to triples with Loren Dion and Ian Ho. Lost both games today. Fiji blew me out 21-7, then lost 21-20 to Norfolk Isl. Latter one hurts. Was leading 20-16 but let it get away. Section play concludes tomorrow. Fiji and Austr on top. Still battling for spot in qtrs with two other guys. Tomorrow gotta get it done! 2 wins today in singles...Philippines 21-10 and China 21-19. Gusty conditions. 17+ sec with wind. Surprisingly I played best at 24m with the wind. Michael will comment on fours, no doubt but they took down Canada this am before losing heart-breaker to Malaysia in aft. From Michael Siddall, Skip of the Team USA Rinks and doubles teams postings on facebook. On to the doubles and triples for the men. Daily update...A tough loss today against Phillipines 17-19. I'm VERY proud to say we came back strong this arvo versus New Zealand. Joe and I played some very special stuff on 16-17 sec's to win 23-13. A real pleasure to finally play Richard Girvan...a true gentlemen. Very pleased tonight. WOW what an odd day...Lost a tough one to Macau (by 1 on his last bowl) who played some amazing stuff down the stretch on 17.5, then enjoyed a first...18-19 sec greens with hectic crosswinds. A nice W this arvo versus Somoa. Need to get 2more W's tmrw to ensure a likely qtr-final. An amazing time by and with all down here! We're off to represent tonight at the Grange Bowls Club 'round the corner! G'day. Had a good day today overall....An impressive win with the boys today vs Canada and had a wild one with defending gold-medalists. Still in the hunt, no doubt!! Nellie ripped it up with 2 solid W's. Stay well all...Time for a sunset. From Kottia Spangler Skip of the rinks and triples teams. Won our morning game today against samoa. in second game had australia 12-13, then lost a 5. but we battled through to the end! havng a fantastic time. getting lots of sun. stopped and visited the mens team tonight and to watch the sunset. home to a rousing game of dominos, now to bed for we play the phillipine team tomorrow.